Microsoft was wrong: Tablets are not PCs. So now what? After years of rumors, LG Electronics may soon announce a number of Chrome OS devices. The Korea-based company recently snapped up several U.S. trademarks with the term “Chrome” in them including ChromeOne, ChromeDesk, and ChromeStation. All three marks are still pending and were filed with the United States Patent and Trademark Office on October 15. 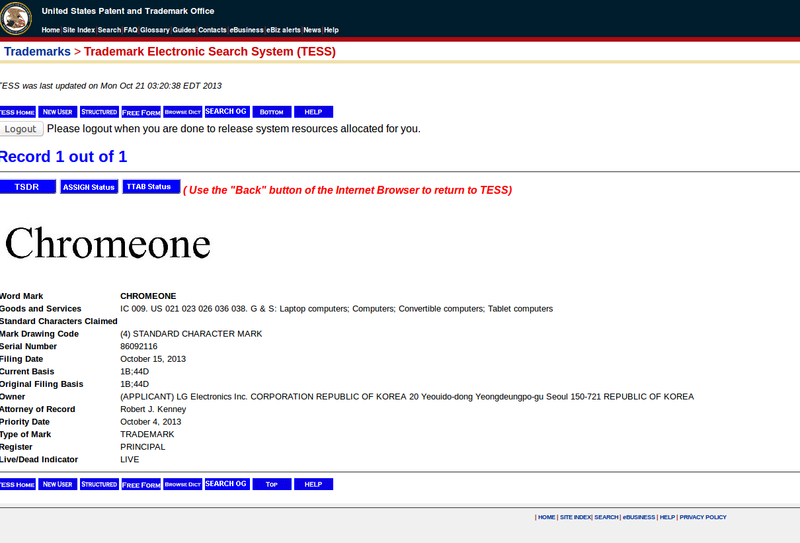 All three are also earmarked for trademarks related to laptops, computers, and, or, tablets. There’s no hint of what these devices might be, but it sounds like LG might use the ChromeOne name for a consumer device. ChromeDesk and ChromeStation, however, sound very desktop PC-like and could be part of an enterprise play to offer Chrome OS-based work stations or public terminals. That’s purely speculation, however. This is one of the three Chrome-oriented trademarks LG has applied for. LG isn’t just going after these trademarks in the U.S. either. The Australian blog TMWatchsays LG has applied for the same trademarks in the land down under. Most likely, the company is applying for these Chrome-related marks in multiple countries. LG’s potential foray into Chrome OS comes as the PC market continues to soften. Earlier in October, research firms Gartner and IDC noted that PC shipments dipped for the sixth straight quarter. Gartner said the PC market fell by 8.6 percent, while IDC pegged the shrinkage at 7.6 percent. Both firms blamed the market retreat on the continuing popularity of tablets and not Windows 8 and 8.1. Nevertheless, with the PC market still in retreat, LG, like other manufacturers, may be looking to expand its PC offerings beyond Windows-based devices. Rumors about LG’s Chrome OS intentions have circulated since at least early 2012. At the time, the rumors were stoked by a patent agreement between LG and Microsoft giving LG the right to license Microsoft patents for Android and Chrome OS devices. The agreement with Microsoft probably had little to do with actual Chrome OS product plans and everything to with legal coverage. LG sells and manufactures a number of Android devices including Google’s Nexus 4 and the company’s own G2. Clearly, the company wanted to protect that segment of its business. The Chrome OS portion, however, was probably more speculative than anything else, at least at the time. With LG snapping up Chrome-related trademarks, we may soon get our hands on some Chrome devices from the company. But when we might see them is anybody’s guess. If Google ever gets around to unveiling the LG-built Nexus 5, perhaps we’ll see a cameo from some Chrome OS devices as well.